Newly constructed contemporary duplex in sunny wood setting. 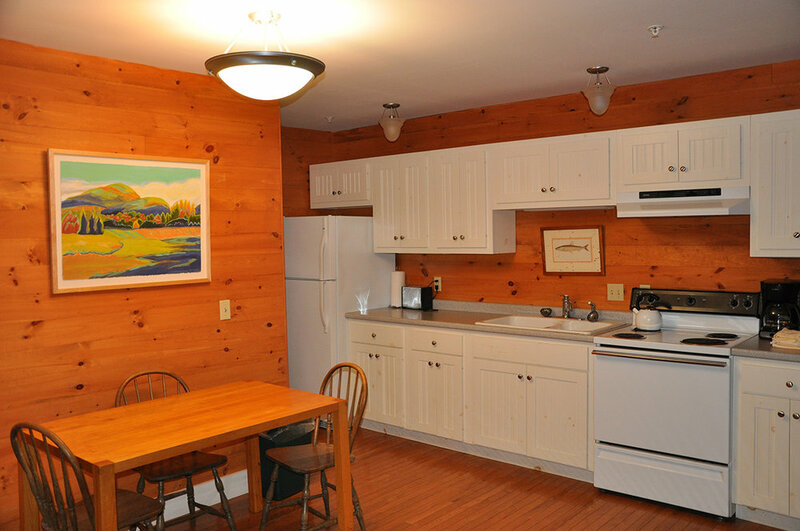 Each cottage has a kitchenette, comfortable living room with a fireplace and one full and one half-bath. 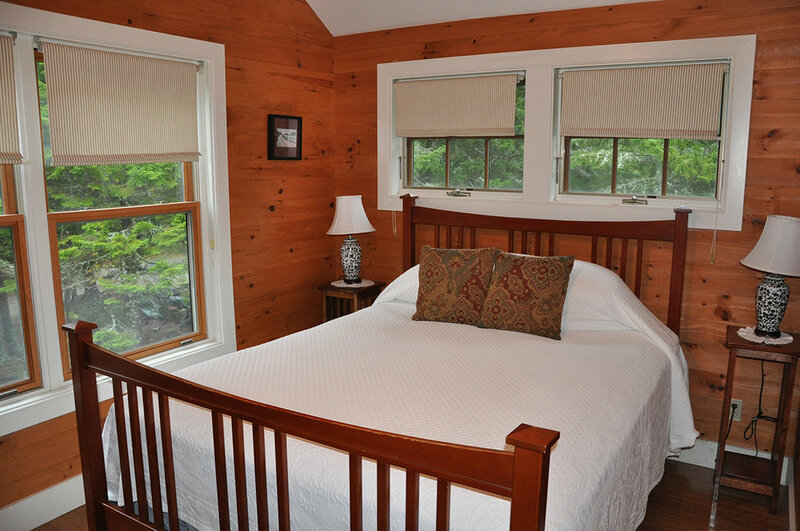 C1 (West) has two 2nd floor bedrooms, one with two twin beds and one with a queen bed. C1 (East) has one 2nd floor master bedroom with a queen bed. Occupancy for C1(East) 1-2. Occupancy for C1 (West) 1-4. 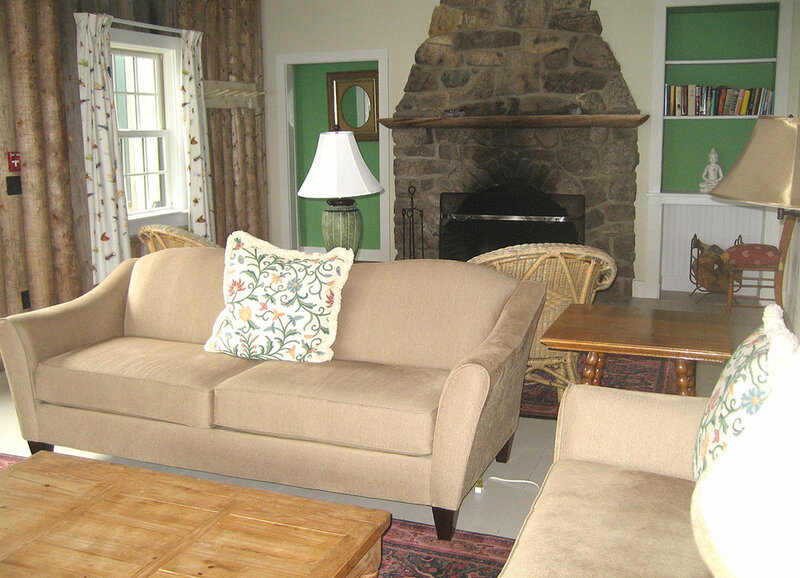 Classic Maine log-style cottage, charming and simple in wooded area on hotel grounds. Comfortable living room with wood-burning fireplace, kitchen and one full bath with tub and shower. 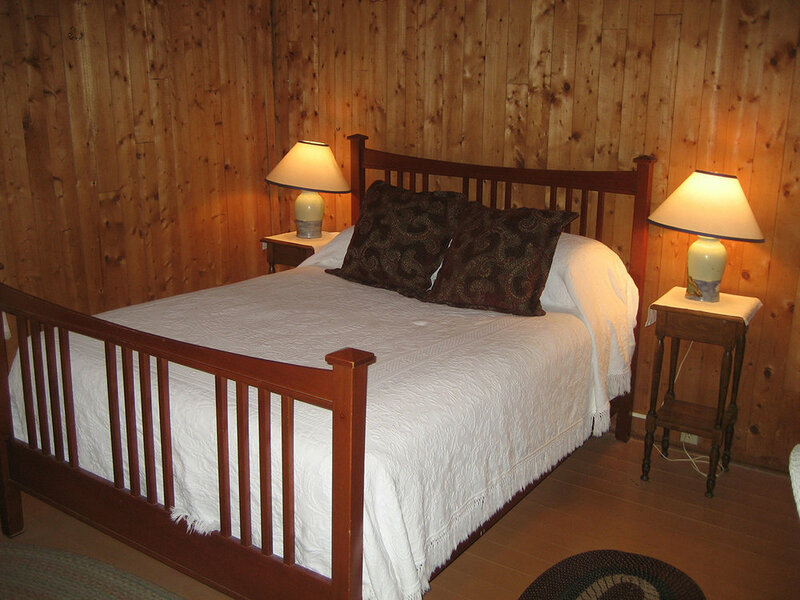 There are two bedrooms on the second floor, one with a queen size bed and the other with two twin beds. Occupancy 1 - 4. Traditional, more rustic log-style cottage sited in quiet wooded area. A brick floor-to-ceiling wood- burning fireplace is the focal point of the comfortable living room. The cottage includes kitchenette, bathroom with tub and shower, and two bedrooms, one with a queen and one with twin beds. A duplex cottage of contemporary design, each cottage has a living room with cathedral ceiling, wood-burning fireplace, kitchenette, and full bath with tub and shower. 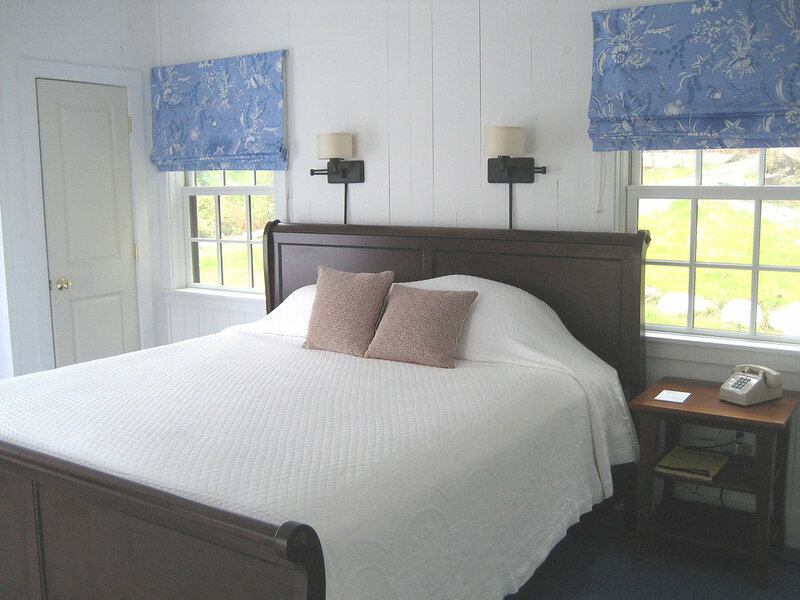 Each cottage has two bedrooms, one with twin beds and one with a queen bed. Each unit has an inviting sunny deck with partial view of the water. Occupancy 1- 4. 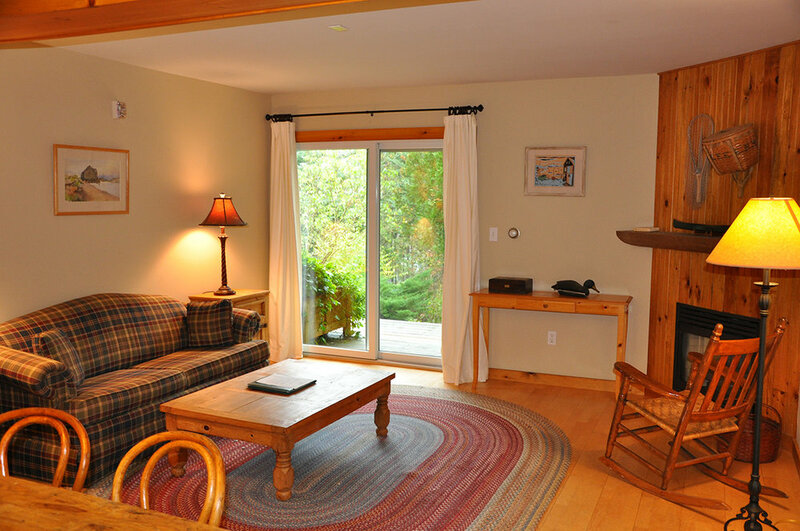 The Wentworth cottages are contemporary studio units all with remarkable views of Somes Sound. 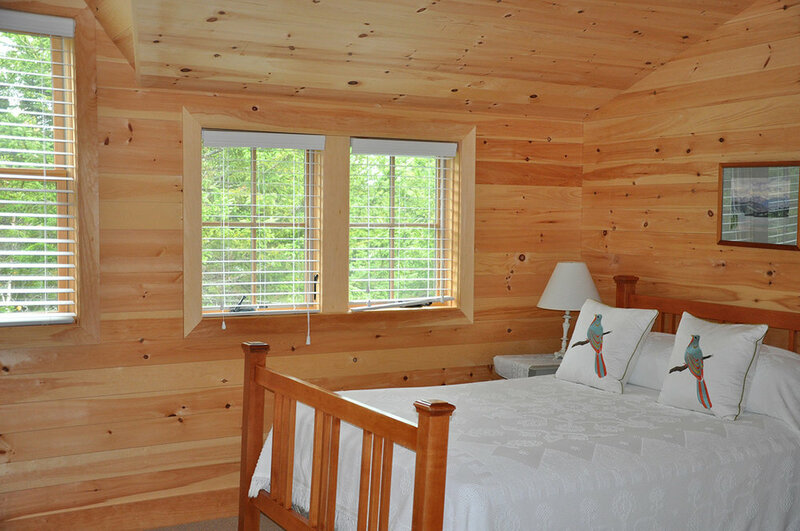 Each cottage has a combined living and bedroom area with queen sized bed, gas fireplace or wood burning stove, kitchenette and full bath with tub and shower. Small sunny decks look out over the ever-changing views. Occupancy 2. Particularly well-situated on the shore with spectacular water views. 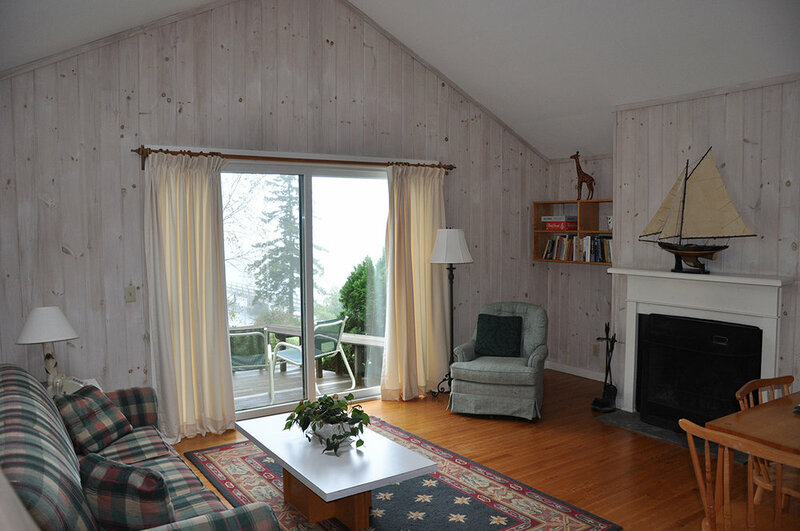 The living room features picture windows and a gas fireplace. There will also be a kitchen and three bedrooms, each with a queen bed and private bath. 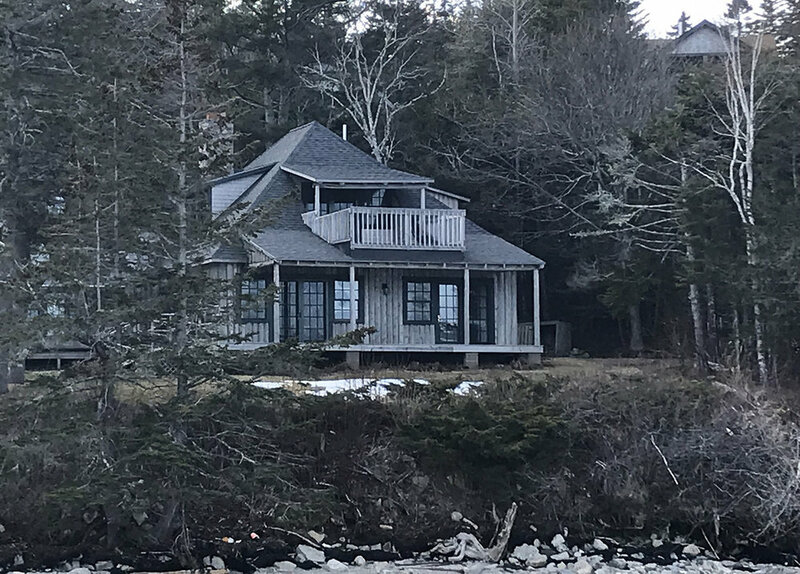 The two upstairs bedrooms will feature small balconies, and the cottage deck is at water's edge. Occupancy 1- 6. The Beadle cottages are of contemporary design, each side with a view of the water and Greening's Island. Each unit has a living room with wood-burning fireplace, kitchenette, full bath with tub and shower and a separate bedroom with a king size bed. Small decks take in the ocean breezes and boating activity. Occupancy 1- 2. The Cole Cottage is on the ground floor of this two story unit of contemporary Alpine design. There is a living room with a gas fireplace and kitchenette, a queen bedded bedroom, and a full bath with tub and shower. This unit has a wraparound porch with rocking chairs and cool breezes. There are two bedrooms on the second floor, Cole 1 & 2, which are rented separately. Occupancy 1- 2. 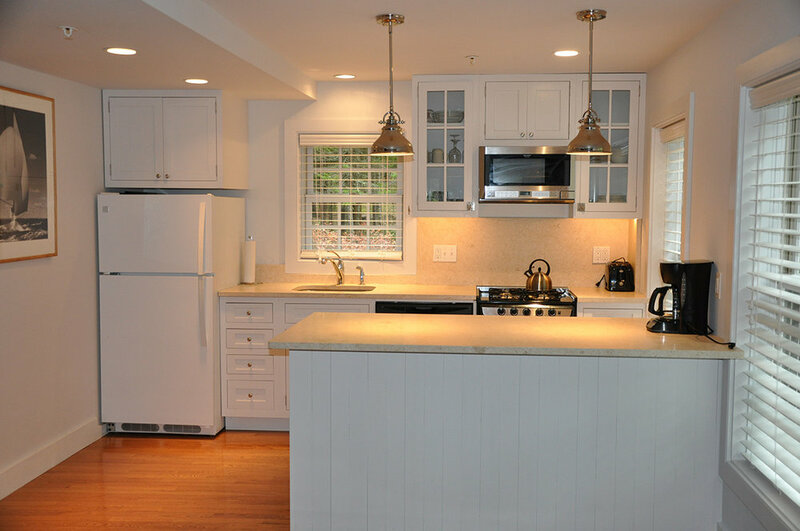 The Rowse House is a large shorefront cottage with spectacular ocean views. 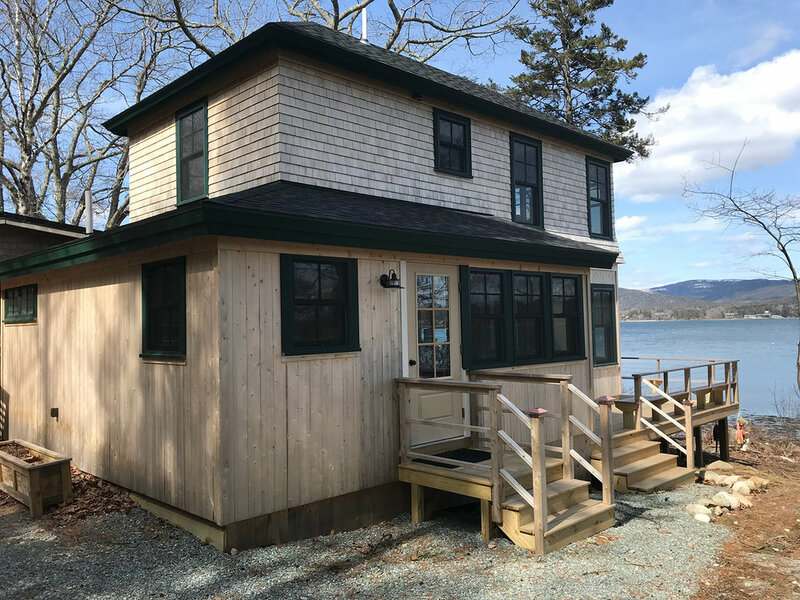 The first floor includes an eat-in kitchen and a beautiful living room with a stone fireplace and great views of the water front. There are four bedrooms, each with a private bath,a washer and dryer. 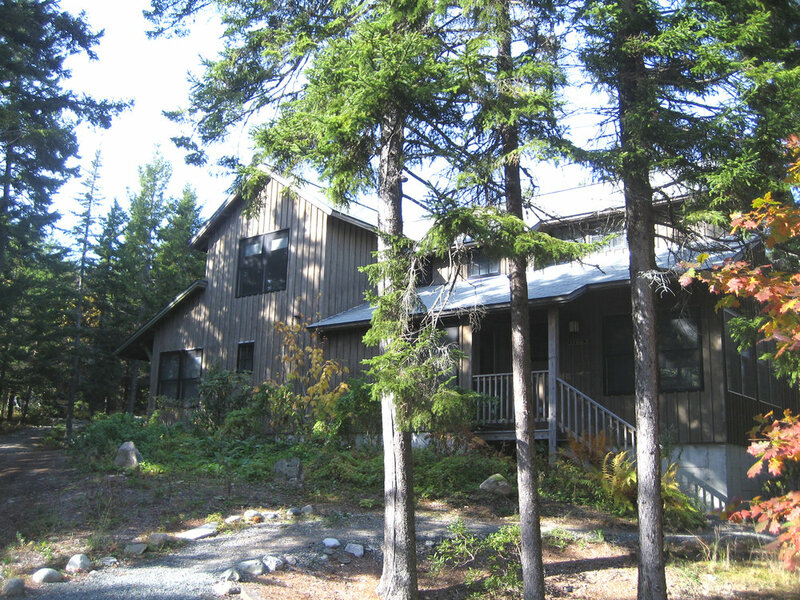 This house has a beautiful wraparound deck overlooking Somes Sound and the mountains of Acadia. Occupancy 8. Rowse House Rates: May 26th thru June 30th: $4,500 weekly. July 1st thru September 2nd: $6,000 weekly. September 3rd thru October 13th: $4,500 weekly. The Rowse House is rented by the week only in-season (Sunday to Sunday), with full payment due 60 days prior to arrival date. * We are no longer imposing a 15% service charge on cottage rates. Unless noted, rates shown are per day. A minimum 3 day stay is required. Light housekeeping is provided. 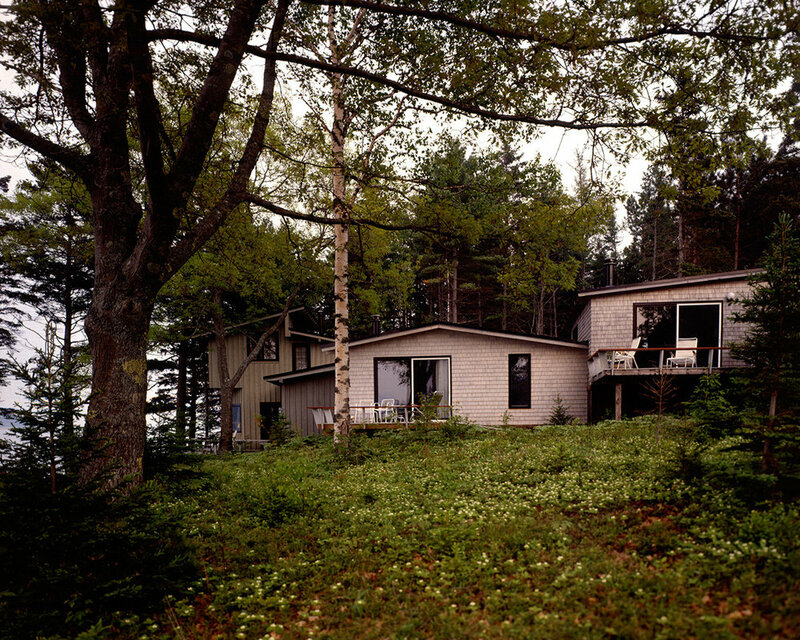 An extra person in a cottage is $35 per day and must be approved first by the management.